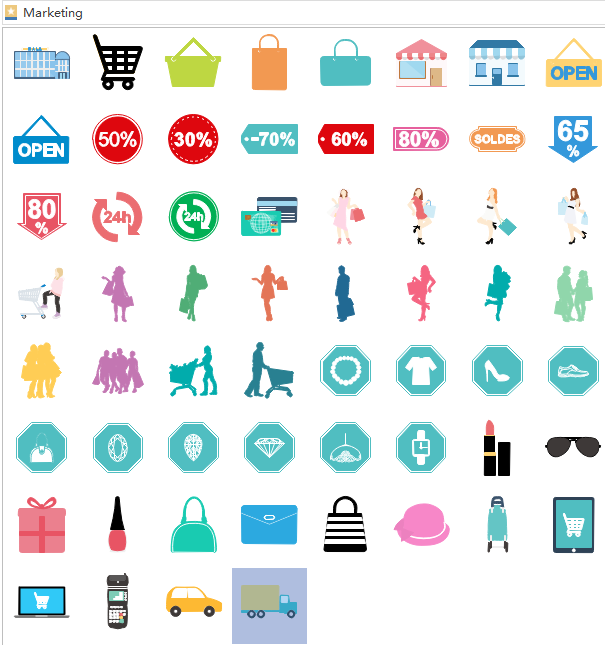 A large set of marketing infographics elements vector are available for free download! Have a look now!. The picture below shows marketing infographic elements Edraw Infographic software offers. They are all available for download, all colors and sizes can be customized. Simply drag and drop the elements needed onto the canvas while creating marketing infographics. It is super easy to apply them to any kinds of marketing infographics you need to create. In addition, in case you need other types of elements, go to the library box on the left of the canvas, you will find all elements you need. TIP: Even if you happen to fail to find the right element among the ready-made shapes, use the "Pen Tool" to draw the element yourself. "Add Anchor" and "Delect Anchor" buttons will help you will the curves of shapes. Hit "Convert Anchor" if you need to change a round angled curve into a rectangular angled curve. It is very convinient. The following is a great marketing infographic template created by Edraw. They might give you some inspiration for your design. Download this infographic software now, and you can customize this example for free! Want to use the above marketing elements in your infographics? Download Edraw Infographic Maker! It includes a large variety of marketing shapes which are easy to modify. Design a wonderful infographic is just a few click away. Try it now!